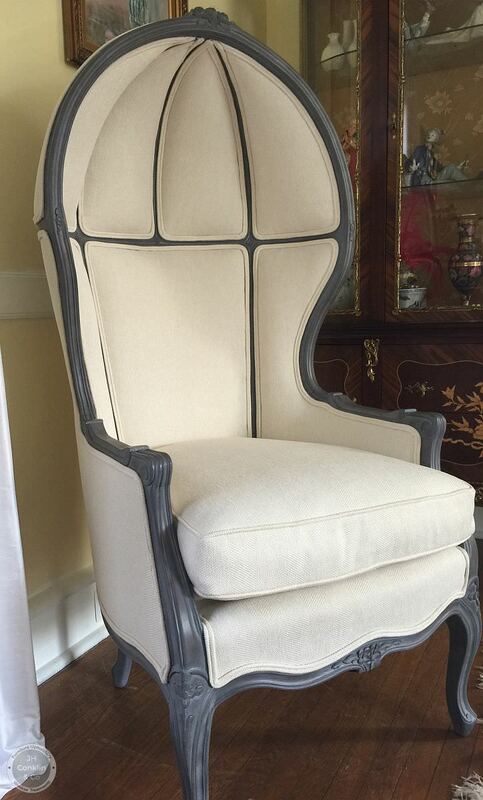 One of our clients, Melissa, from Haddonfield, NJ sent us some pictures about a chair she wanted to re-work. "The canopy is so elegant, but the yellow fabric and dark walnut finish have to go." She had found a reproduction porter's chair - also called a canopy chair or a dome chair. The porter’s chair dates back to medieval times in England and later to France. It was a chair positioned by the front door of an estate or home where a hall porter sat as a gate keeper. The hall porter received known and invited guests to the chateau. The entrance halls were often unheated and the domed back and enclosed sides of the chair warded off chilly days and drafty nights. When we asked what she wanted in place of the dark walnut finish on the chair, she pointed us to a picture of a finish we recently put on a pair of arm chairs. "Like that, but maybe a tad more bit of white to it. But not all shabby looking." OK. So a DEEP frosted glaze instead of a regular frosted glaze. But not a lot of hang and definitely brushed out. This was a frosty chill-zone kind of finish. Several dozen upholstery fabric samples in textured off-white sparked the fabric selection. She chose a moderately textured pattern by Greenhouse Fabrics - B2632 Cream. With young children in the house - and a white fabric - she wanted some kind of stain and spill protection on the fabric. We had her yardage treated with Nanotex before beginning the upholstery. The original down cushion was overly crushed. And with the seat deck sagging a little, the chair sat low and lumpy. A new foam-core down wrapped cushion and a tightened seat deck would ensure comfort. All the brushing and spraying and prying-of-tacks and cutting and sewing and stapling and cushion-making came together on delivery day. Melissa was not there to meet the field crew, so we all had to wait to see what she thought about her updated Porter's chair. Thank you for the beautiful chair - it is so polished and elegant looking. I love the color of the hardwood, and the fabric pairs so nicely with it. We appreciate your attention to detail. It’s a work of art. She also sent a photo of her youngest daughter enjoying the chair! Curious about what a new Porter's chair would cost with similar finishing and upholstery options, we searched furniture retail sites. The nearest we found was at Belle Escape at a base price of $1,795 and equivalent fabric and finish options for $2,145 - excluding the protective fabric treatment.